@ScottHarveyWine said it's fun to be back and shared some Notes From the Vintner The drinking window on these is now and for another three years on the Three Stags and now and another five to seven years on the Zinfandel. @rpm said this is an rpm AUTOBUY Outstanding Zin. And the blend is great for everyday drinking, gifting, or bringing to holiday parties. @dmcswiggen thinks this is OBVIOUSLY an auto-buy I was kicking myself for not getting more… now I’ll have 6 to enjoy for a while. @chipgreen agrees with all the “auto-buy” comments Scott’s wine is already a good value at retail pricing. At Casemates pricing, it’s a no-brainer. This robust blend is produced in a richer extractive style. Briary with layers of blackberry, bright red cherry, pomegranate, violets and balanced with a fleshy center and Amador regional earthy tones. From select vineyards in Amador County. Produced in the old world style of balanced wine making. We want the wine to express a good balance of fruit, French oak, structural tannins and medium alcohol. The smell of a fresh rain on a dusty road. Chocolate covered cherries abound in this red fruit wine. Cranberry mixed with mincemeat show through this extractive claret style “Old World Style Zinfandel”. A rich mouth feel adds to the rounded complexity and long lingering finish of this medium bodied wine. Try this food friendly Zinfandel with any grilled meat or chicken or pair with pizza, pasta or burgers! Produced from the vineyards located in the Shenandoah Valley of Amador County. The granite soils of Amador County are well suited to producing distinctive, earthy, full bodied Zinfandels that have a wonderful character all to themselves. 2014 is a drought vintage which produces a claret style Old World Zinfandel. No-brainers. Ducked in before the crowds. Double no brainer! Early Christmas gift to me. Thanks WD & Scott! An rpm AUTOBUY - what can I say? Outstanding Zin. And the blend is great for everyday drinking, gifting, or bringing to holiday parties. My first order of 2 cases on here! @Leonifarms I didn’t go in on your offer, but I appreciate you contributing on offers that do not benefit you. Good stuff. Cheers. No GA? What is this madness?!?! Give the winery a call and we’ll try to take care of you. 707 968-9575. @malex_vt VA allows shipping now? I totally missed that! @malex_vt @winer Virginia has been on the vast majority of offers in Casemates so far. To my drinking pleasure and wallet’s chagrin! I love their Zin but I thought the Three Stags was kind of meh. C’mon guys, bring on the Scott Harvey Barbera! @winer that’s what I’m talking about! Barbera/Zin combo would have killed it also. @winer Three Stags, while not fully in my wheelhouse, it a great cellar saver and has most always gotten complements. My concern is the cold. I know special things are done in the summer but is there anything done for super cold weather Minnesota shipping so it doesn’t freeze on the truck overnight? @kaolis Thanks. I’ll give it a shot. I have bought Scott Harvey before from Woot and enjoyed it and the price seems nice here so let’s go with it. Fun to be back. On the road today, picking up barrels in Napa. Getting ready to head back to Amador, so will get back on when I get back to the winery. The drinking window on these is now and for another three years on the Three Stags and now and another five to seven years on the Zinfandel. Thanks RPM and Jon at Leoni for the support. Cheers and happy and healthy holidays. Can anyone compare this Zin with the 2013? Auto buy. No rattage needed. Agree with all the “auto-buy” comments. Scott’s wine is already a good value at retail pricing. At Casemates pricing, it’s a no-brainer. @chipgreen No duh. Just got ~5 cases with club+ pricing, including both in this offer and @winedavid49 blows it out with this pricing. I’m thinking of buying a case if anyone in LA is interested (I’m in the Southbay near LAX). OBVIOUSLY an auto-buy. Just finished up the last bottle of Mountain Selection Zin from the previous offering on Thanksgiving, as it happens. I was kicking myself for not getting more… now I’ll have 6 to enjoy for a while. 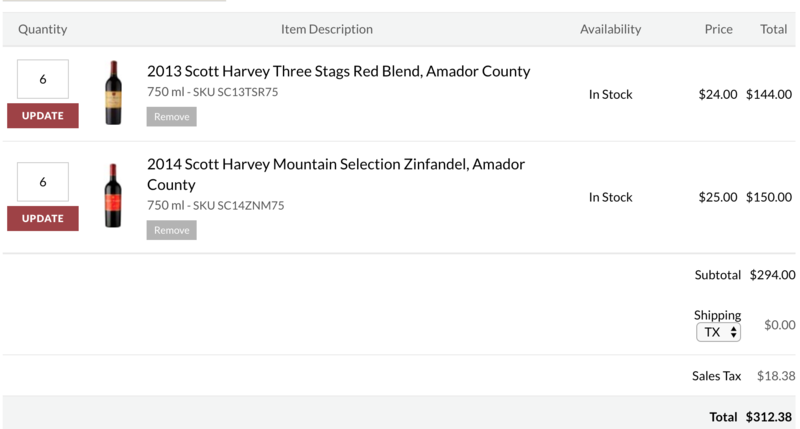 Any Scott Harvey wine is an autobuy for me as well. Second only to Wellington on my quality vs price ratio list for zins. @Minnehaha have you tried his Barbera? @rjquillin I have. Got a mixed case back on the old site. I enjoyed it as a change of pace, but Barbera is not among my favorite varietals. @Minnehaha It’s just such a versatile food wine, it’s difficult to not like what Scott does. Scott Harvey wines have always been wonderful-so glad to see them here right before Christmas!! @valed1 +1 for please ship to Georgia! If this shipped to Georgia I’d be in for a case! If I needed cellar savers I’d be in! But I don’t have enough things to go to where it would make sense to go in for a case. But I will see if my office manager would get a six-pack for happy hours. These would go over more than brilliantly. I just opened a '12 Three Stags. I was just looking on Scott’s website one day before this sale, are you guys stalking me?? His Barbera is our FAVORITE…so good. Nice pricing on this deal! Ok, so I looked in the back and I still have TWO of the SH 2011 Syrah “signature” double magnums from Woot! but only one Zin left and I have never tried the 3 Stags. I guess I have talked myself into this deal now, lol…always a huge fan. It’s time to open the 2011 for the Holidays. Just one bottle will be enough for all! It’s Christmas time, I’m not supposed to be getting gifts for myself!